Eurybia divaricata is a perennial herb, 20-100 cm tall, extensively clonal from rhizomes, stems thin, stiff, rather brittle; green to pale tan becoming darker with age, zigzag. Stems with flower bracts persistent through winter (Gargiullo personal observation). Leaves, alternate, 4-20 cm long, 2-10 cm wide, lower leaves heart shaped, margin sharply toothed, dark green tip long-pointed, appearing March-April, upper leaves smaller, reduced, more egg-shaped. Flowers white, 5-16, about 0.7 cm long, disc flowers yellow, becoming red-purple, bracteate base of head 0.5-1 cm (see Asteraceae); inflorescence broadly branched, usually rather flat topped, blooming and fruiting Aug.-Oct.; visited by numerous bees and other insects. Fruit dry, 1-seeded, achene, with tuft of hairs (pappus), wind dispersed into winter,. Migration to distant or disconnected forest sites has been estimated at a rate of 0.61 m/yr (Matlack 1994). Habitat: Understory herb of upland closed forest and woodlands, drought tolerant, very shade tolerant. Tolerates acid soil down to pH 3.8 (Greller et al. 1990). In NYC found on soils with pH 4.8-5.4 (Gargiullo unpublished data). Notes: Often found along with Eupatorium rugosum, Geum canadense and Polygonum virginianum. 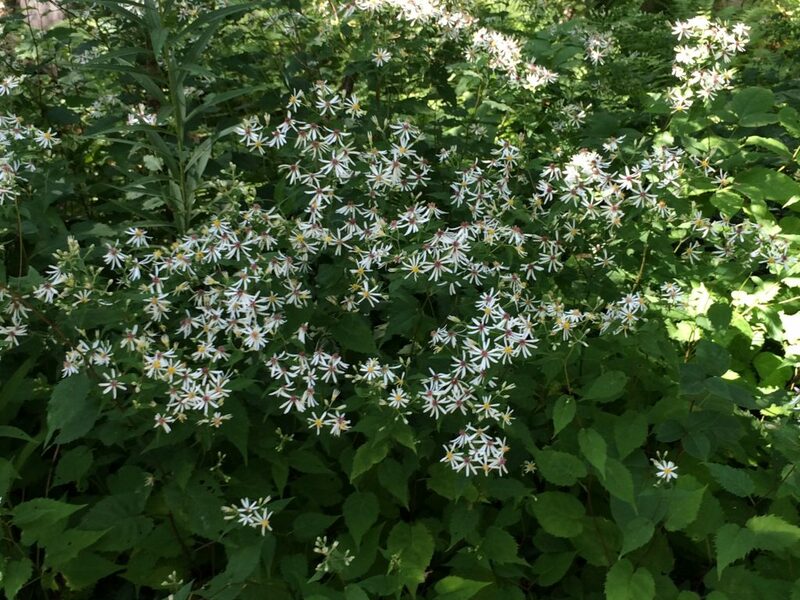 White wood aster is one of the forest herbs most tolerant of disturbance and urban conditions. 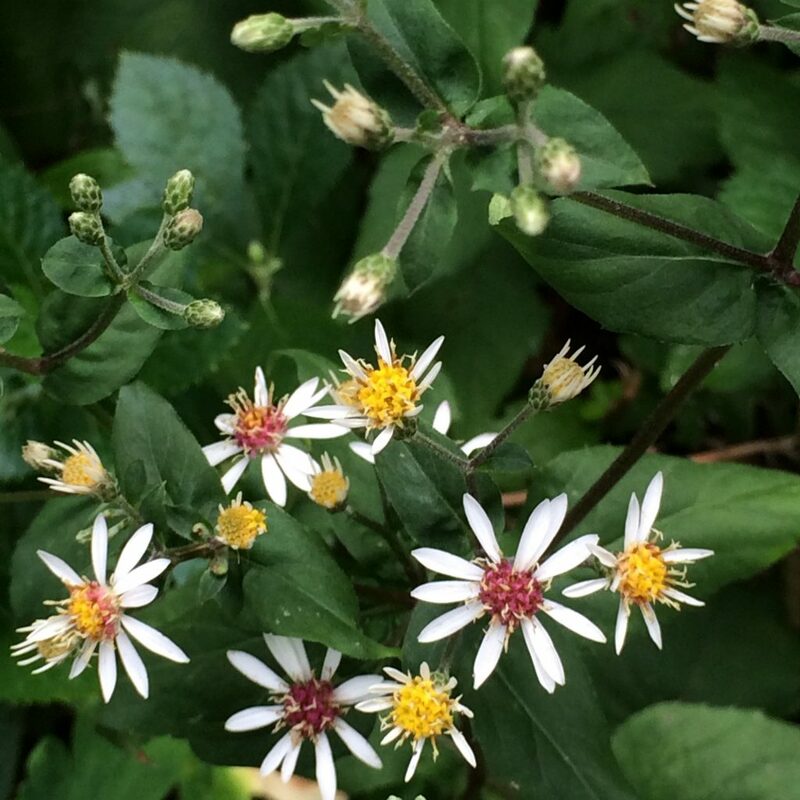 Foliage very similar to A. cordifolius but white wood aster flowers earlier and has larger, white flowers (Gargiullo personal obervation).